Today was the bench press competition and it was a very well-run meet in War Memorial Gym on the VT campus. I was very satisfied with my efforts, opening with 105, then 115, then finishing with a personal best of 120 that I had not been able to get in the gym prior. I weighed in the night before at 119 so I can say I benched my bodyweight. So now I am determined to work toward a solid 135 lb bench. I was never able to get that in a meet WITH the assistance of a compression bench shirt, so I'd like to finally achieve that goal "raw". I am giving it a year, but JRP predicts by the end of the summer. So now it's strange to look at my list of "upcoming competitions" and see only ONE on there. Granted it's a big one, but I need some intermediate goals and a few following. I know I want to do the Brush Mountain trail race again next fall, and I'd like to support BCC in the swim meets this summer, but I need to find a few other adventures along the way. No doubt, I will!! I think I have finally recovered from an all-out effort at the Blacksburg Classic 10-miler. It was such a busy week for me with a conference + teaching + family duties, so I didn't feel rested or as prepared as I could be mentally or physically. Nevertheless, as I toed the line at 1:15 pm, I told myself to give it all I had and how disappointed I would be if I finished without doing my absolute best. That was not the last conversation I had with myself on that course. It was a constant battle of wills out there and by the time I finished, I was tired of listening to myself! I finished right around 1:15, with an average pace of 7:30. It was an improvement in pace over the last half-marathon, and although this race was shorter, it was definitely hillier than anything else I have run competitively. I managed a nice kick for the last 150 m and finished strong. We couldn't have asked for a better day - it was in the upper 40's/low 50's and sunny! The promise of spring was palpable. The icing on the cake was to receive the overall master's win for the women (40-49). I enjoy the training process as well as the pre-and post-race festivities, but the actual race itself can leave me bereft, wiped out. Not until the next morning do I feel OK again. The running community is a great one - welcoming and mutually supportive. I've run into old friends, made some new ones, and it's just enjoyable to get together for what my friend Steve calls not a race, but "an organized run." We are ultimately running against the course and against our own doubts and self-imposed limits. Sometimes I can just feed off my own positive energy and those are the best races. Other times, like yesterday, it's a battle of wills and pure stubbornness that gets me through. That was a tough one. I learned that someone had said that it was a shame that my running and fitness interest didn't kick in earlier in life. I had several immediate reactions, some more gracious than others. Guaranteed the person who said that is under the age of 25 with limited life experience. My drive has indeed manifested itself in what I characterize as success across my multifaceted life. They haven't seen ANYTHING yet. I'm just getting started on this newest adventure. As proud as I am of the year's accomplishments, I am most humbly grateful for the circumstances of my life and I wouldn't change a thing. This year has been so much sweeter precisely because it is happening now and because of all that has led up to this point. Would I have had the same focus, drive, and discipline 15, 10, or even 5 years ago? Doubtful. It's because of the tapestry of challenges and experiences that I have had that I can do this now...and appreciate it so much. And would I even be on this path had I not met up with JRP? Doubtful. Timing is everything and somehow he is just very well tuned to what drives me. So what else led me to this year? Growing up, horses, riding, Pony Club, and horse shows were my life and I owe much of my discipline to that. From riding I learned two chief lessons: (1) things worth doing require a long-term investment in time and effort with a big-picture perspective that allows you ride out the daily ups and downs and that (2) relationships - with people and horses in this case - are important to nurture as the sense of community is a key ingredient to motivation and success. And I found much success in riding. By college I was ready to explore new options and I found myself at the Weight Club and plugged in with a group that powerlifted. 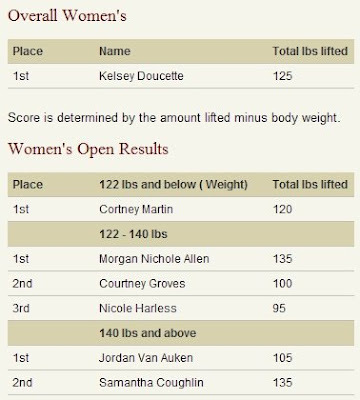 Despite having a long lean body that was ill-suited to the sport, I persevered and found myself ranked in the top 20 nationally for my weight class (132). This was a good reminder that one can't put limits on oneself or make assumptions about what is/isn't possible. I returned to riding again, but in a new discipline - Dressage. I found a trainer in Lexington, VA and drove there 3x a week for two years to work with her and one of her warmblood horses. I quickly rose up through the levels and received multiple year-end championships. When I was several months pregnant with Spencer and my show clothes no longer fit, I took leave from riding. But from this experience I gleaned that when there is a will, there is a way. If you have the dream and the goal and are willing to do whatever it takes to get there, to help yourself, you can. Now after one child, a temporary move to Atlanta, and the birth of a second child, we returned to Blacksburg where we built a house. I assumed the role of project manager which came in handy when our contractor blew through all of our money and took off before the home was done. My role was instantly elevated with tremendous time and financial pressure. We got the job done and let me tell you - that took my organizational, networking and communication skills to new levels! Once we settled in, I returned to work after several years out. I taught as an Adjunct Instructor in the department of Engineering Education. One thing led to another and I found myself back in grad school to finish a PhD in Human Factors Engineering in Industrial and Systems Engineering. I had made one unsuccessful go of it earlier in life. This time, coupled with my own research idea and a great advisor, I had a great experience and completed my degree more quickly than most thought possible. The takeaway here is how important interest and passion are, and how dedication takes discipline, sacrifice, and single-mindedness. I laugh that at every home football game for two years, I was parked with the tailgaters in the commuter lot, only I walked to my office in Whittemore where I worked long weekends. Fast-forward to this year and the long-strange-trip-it's-been! This year has shown me that I can juggle and manage more than I ever thought possible - family, work, gym, running, tennis, and service. I'm stronger than I knew I could be. And the icing on the cake is that I have a beautiful family with two amazing, interesting, talented, and fun-to-be-with kids. I maintain contact with many friends from other phases of my life and I see where many put all their eggs in one basket and have been left somewhat dispirited. Sacrifices had been made and dreams not quite realized. So maybe I didn't become an Olympic athlete, but what are the odds are that I would have anyway? Would I have been any happier? Or perhaps less so? Running, lifting, and sports are a much more personal endeavor for me than others - my version of dance, of play, of silliness. I am grateful to be having this experience exactly now and in exactly this way. I have no regrets. I hope that I can inspire others because I am doing this as a crazy-busy mom. And again, it's only because of challenges and experiences of the puzzle pieces of my life that this is working now. For me, I find joy in a rich and diverse life, juggling many aspects of family, fun, fitness, service, and work/teaching. And the best part is watching my kids explore their own interests and find life lessons and satisfaction in their own personal struggles and successes athletically, academically, and in their own souls. Late bloomer? Nah. No way...I'm a perennial bloomer! There are no limits on THIS girl. And to whoever tossed this comment out so casually, I hope you will continue to bloom and rediscover yourself in a variety of ways throughout your life and see that life needs to be examined through a wide angle lens more often than a magnifying glass. Thanks for spurring me on. When I hit my first 225+ lb deadlift and qualify for the Boston Marathon I will think of you and wish you well. Yup, some days the hardest thing about a run is just leaving the house. Today certainly qualified. With a house full of 6-7 year old boys who slept only from 11 pm - 4:30 am, I was left tired and depleted. It didn't help that I had the beginnings of a chest cold. The scheduled workout was a ladder - mile, 1200, 800, 400, 400, 800, 1200, mile. I had goal times to hit and nothing motivates me more than a quantitative milestone. I got to the track and started my warmup, then headed into my first mile. The data fields on my watch were not set up to give me the right information - I needed lap time, lap distance, but they were set to overall time and distance, and I had started my watch on my warmup. Without any guiding information I figured I'd just better haul, because I was not going to run that mile over, nor would I chance missing the target time. Even as distracted as I was, I logged a 6:10 pace for a mile. I think that was a first. I continued strong through the ladder, but the final mile was closer to 7:00 than 6:00! I ran half of an 800 with a flapping shoelace, also not wanting to stop and having to redo it. I ran a 1200 with my watch set to "off" and did have to re-run that. That left me a bit deflated, but when events conspire against me, I take that as a test of my commitment. I won't shrink from that. I'm definitely running faster and stronger. The amazing thing is that the journey to faster and stronger has been gradual and fun and gratifying. I think we often believe that to make gains it has to be terribly difficult and overwhelming. Not so! I'm glad I took that first step out of the house. Otherwise I may have missed this opportunity to show myself what I can do! I was asked to be the featured member in the Weight Club newsletter. I wasn't sure I wanted to really do that but then thought if it helps someone to set their goals a bit higher or work a little harder, then it's worth doing. 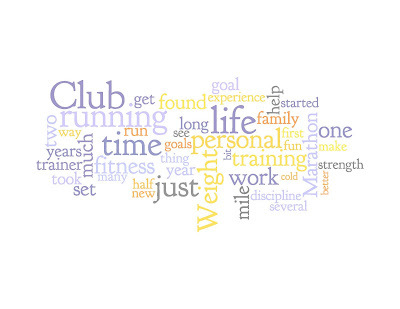 How long have you been a member of Blacksburg Health and Fitness and what brought you to the club? I joined the Weight Club in May of 2008, but I had been a dedicated member for many years during the 90s. Then came marriage (to my lifting partner! 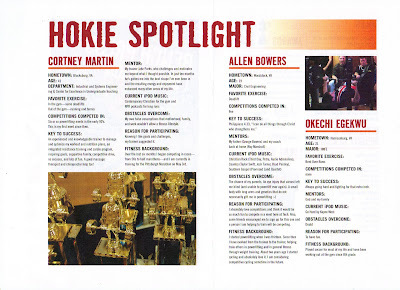 ), two beloved sons, a return to graduate school, and a faculty position at VT. Personal fitness took a backseat to life’s demands and I bought into the myth that moms can’t make time for their own fitness needs. Last spring it caught up to me as I suddenly realized I was in the worst shape of my life, carrying extra weight and lacking energy. I knew I had to make a lifestyle change but was at a loss on where and how to start. I researched personal trainers, and contacted trainer Jake Parks based on his academic, athletic, and professional background. I made an appointment with him, joined the Weight Club, and the journey began. My initial goal was just to “get in shape” but thankfully Jake encouraged me to translate that into more tangible goals. I had started running a little, so he suggested I consider a half-marathon. My initial response was “no way!” But I began to envision the sense of accomplishment that it would bring, and I signed up for the Danville Half Marathon. Jake developed a balanced workout and running plan to fit in with my busy schedule. 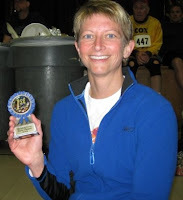 On September 13, I completed the Danville Half Marathon that had previously seemed so daunting. Along the way I found myself 25 pounds leaner. Since then, I’ve run several other races, gaining strength and confidence with each, including the Brush Mountain Breakdown 15 miler and the Roanoke Star City Half Marathon. 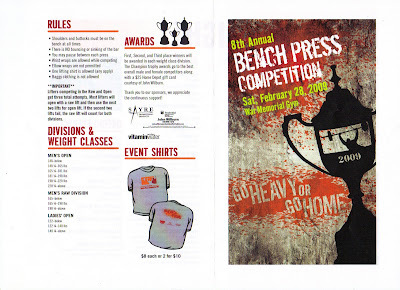 I am currently training for the VT Bench Press competition, Blacksburg Classic 10 Miler, and the Pittsburgh Marathon. And while these external benchmarks serve as a focus, my main goal is just to have fun and get healthy while discovering my inner athlete! How has having a personal trainer helped you reach your goals? Without the help of a personal trainer, I believe I would still be chasing the elusive dream to “get in shape.” I find I need the structure, education, and accountability. This represents a reversal in my thinking because I used to view personal training as a bit of a crutch or luxury. But now I see it as an investment in my health that has had a trickle-down effect and has inspired my sons in their own fitness goals. Jake maps out my strength training and running plans and makes adjustments as needed so I am spared the time-consuming and complex job of planning. He has a lot of knowledge and personal and professional experience to draw upon including from his own wrestling, marathon running, and bodybuilding. With the programs he designs, I know my workouts are optimized, I’m not over- or under-training, and I have sufficient recovery time. My role is just to do the work, making every rep, set, run, and interval count. He keeps things challenging, interesting, and fun and regularly introduces new exercises. Another goal of mine has been to learn to eat better and to help my family to do the same. With the trainer’s help and by logging my food online (sparkpeople.com), we are all making better choices and the contents of our refrigerator and pantry have changed substantially! My current program includes strength training four times a week (two with my trainer) for about an hour per session, running four times per week, and cross-training on the bike or elliptical. 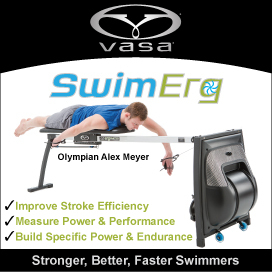 I also play tennis year-round and enjoy swimming during the summer. Probably because of my powerlifting background, I most prefer the basic foundation exercises – pull-ups, pushups, deadlifts (sumo style), bench, squats, and lunges – where it’s just me against gravity. Similarly, I love the freedom of running and the mental and physical toughness required to persevere on long runs and during speed work, particularly in the cold! Do other members of your family belong to the Weight Club? We are all members of the Weight Club. My son Spencer (9) is working toward a 5K and enjoys the track and basic strength training. He works out weekly with Jake too. Grant (7) participates in the Karate classes and enjoys the kid’s room with the Wii. Unfortunately, my husband Robert’s schedule does not allow him to utilize the club much at the moment. What are your favorite things about the club? I appreciate the family-friendly services of the club, the great staff, and the fact that people of all ages feel welcome to enjoy and utilize the facility. The location is convenient, particularly the proximity to the Easy Chair Coffee Shop and Runabout Sports!